I was actually looking for tips to placing mercs and militia when defending drassen mine. 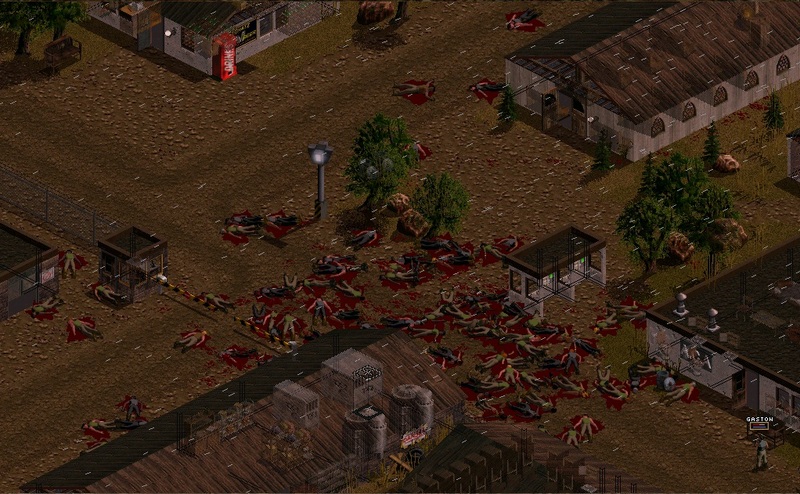 I've seen that unsurported spread militia will quickly get killed, they kill them and advance. And you'll probably have to retreat all the way back to the gates of the airport. There is one general tip about the Drassen counterattack, that seperates JA2 from the 1.13 mod, that could be a sticky one: In ja 2 you create your IMP and hire some mercs and obviously you need an income to keep those mercs so you take the mine. But in 1.13 mod you're allowed 6 IMPs that once created are free, which mean that you can wait with taking the mine. Fx. go to San Mona first and do alot of boxing while also attacking patrols until you got so many dollars that when you take Drassen airport you can order the best equipment and when you take Drassen middle, you can fix the food quest, so you also get Dimitri - free -, before doing the mine. Until now I've called all militia to the upper left corner and made them lie, cause else they'll shoot eachother on attack. And my mercs are at the miner taking out those enemies there. So when all those enemies from right side clutch together in the middle going after the gun fire, I got a spotter on a roof. And some mortars in the bunch will seriously lower their danger. As more support it might be an idea to stop Dimitri in the field with 40 mobile miltia on one side of the mine. You may do the mine at a very, very late time in the game - just DON'T take the middle sector. There is one general tip about the Drassen counterattack, that seperates JA2 from the 1.13 mod, that could be a sticky one: In ja 2 you create your IMP and hire some mercs and obviously you need an income to keep those mercs so you take the mine. But in 1.13 mod you're allowed 6 IMPs that once created are free, which mean that you can wait with taking the mine. With all the new additions/features implemented, maybe it's time for a new approach to DCA. Camping the foreman's house is probably your best bet to successfully defend drassen against counter attack. In my game it always happens at night, which makes things a bit easier. In my last game I didn't have any militia in the sector and I used an AIM B-team (B is for budget ) without using IMPs - Hitman as squad leader, Fox as close range combat/medic, Igor as my night ops guy (he really becomes great later on), Barry as mechanic and Ira because she's free (although I have to say, she is rather reliable when it comes to shooting, especially compared to Barry or even Hitman). If you camp the doors you can easily bait a couple enemies through there, even with new AI settings set to TRUE in ini file. Having a merc with squad leader/deputy perks helps immensly at start, because you will get A LOT of interrupts. After you kill off a couple enemies, they will most likely camp either SE or NE part of the building. You can simply position two or three mercs with auto weapons (smgs at that point) along the walls and try to bait some more before finally cleaning up. This tactic has worked in pretty much every version of 1.13 I've played so far, even before new trait system, so it's battle proven . In case you're wondering, last game was on Expert and Ironman mode. Rest of the stuff was mostly set to default (max enemy team size set to 20, new AI enabled), with sector reinforcements disabled. Drassen Counterattack is alot easier when you have mortars and grenade launchers. If you follow these steps, you can easily repel such an attack even on Insane mode. - Buy out all of the mortar shells and smoke shells from Bobby Rays. Buy plenty of 40mm stun grenades (or thermo ones if your rich!). - Assign two mercs to grenade launcher duty and another to mortar duty (2 mortar mercs are even better). Place the mortar guy on the bathroom roof-top. Place one launcher guy on rooftop near east edge of map, and the other launcher guy on the mine office roof-top. - Assign one as a sniper/spotter (high-powered scopes/binoculars are needed). Place him on bathroom roof near mortar guy. - Assign a weak merc (ex. Ira) in militia command duty. The purpose of this is to help your militia survive alot longer. Militia survival is very important in this battle, because they are primarily used as targets who draw fire away from you! Always have this merc stay next to as many militia as possible! - Before the battle even starts, make sure that your spotter has his weapon raised towards edge of map, so he can spot enemies first (this is VERY important). You will want to make the first move in this battle! - place mines near rocks/trees, and near the edges of the map where enemies are likely to arrive at. These places are: southwest corner passed the mine office, the entire east edge of map, the south edge of map, and northwest corner. - have your sniper take down the first enemy (an elite if possible). If he has spare AP's, have him spot another corner where enemies are likely at. - launch a smoke shell on a corner where enemies are spotted. Some enemies have gas masks, but they will be taken care of by thermo/stun grenades! - Your militia should be popping out from the buildings and wailing on the first wave of enemies. Some will be very retarded and run into the smoke (which is why we won't be using mustard-gas shells!). - Using your weak merc, command your militia to follow him, take cover, or attack whenever necessary. When a enemy wave is no longer a threat, direct your militia to another corner where enemies have arrived. The priority here is to disable your enemies to the point where your militia can close in and finish them off. Letting your militia take the kills is important because they may very well be promoted to elite status! Repeat these battle steps for every wave of reinforcements that arrive! How does the reinforcement work? Is there any certain number of militia or soldiers left after that they start entering the sector? In options.ini you defined how many guys of each faction (militia and enemy soldier) can be present at the same time on the battle field each. If there are more enemies attacking than that (IIRC 32 by default), every enemy you kill gets replaced by another next turn until there are no more reinforcements available (=no more than 32 enemies left in total). Same with militia reinforcements. Well I counter attacked the Drassen counter attack. However it was on expert and slow weapon progressions. I took Chitzena first and had 18 days of time to gear up for it. Gearing up by killing patrols and gun runs to bobby ray. I underestimated how much you can "work" these mercenaries. I went with Bull, Spider, Ira, Dimitry, Igor and Meltdown. One rifle, 3 SMGs and 2 Pistols. I took Drassen and the SAM site in 2 days and then hired some help from Grace and Barry and an IMP handy with rifles. I only had enough time to rest before they started camping outside. Took out the 20 to the east of the mine, and then most of the western attack force in a cover of a storm. However Igor and Dimitry died. They took the mine but I took it back that same night. It's not impossible to defend Drassen but its damn hard. This is supposed to be guerilla warfare not to equal states at war I never pass the opportunity to fight the enemy on my terms instead of waiting for them to attack me on theirs. Well yeah, fighting the enemy on their terms tends to mean a lot (A LOT!) of unwanted losses. These days I use nighttime hit and run tactics after letting those bastards hold Drassen for a while. Pick a few off, retreat, regroup, repeat. A full assault happens when they're down to 30 or 40. 6 (or so) versus 40 isn't exactly optimal but by then I've usually been able to scrounge up some decent rifles. Thx to Sam for at least trying to answer my question. I had my doubts about this theory from the start, because they all jumped in at the same time when I had fights with reinforcements in other sectors. Last night I did the Drassen fight again, avoided it long time and came with 3 squads with snipers, granade launchers and automatic weapons with scopes and laser pointers. Few came from the south and west and when the bunch of the east troops was killed there was rarely movement, but in the strategic view I could see there were lots of them still there. A sniper spotted some of them in the northeast corner between two buildings, so I went with 5 or 6 guys behind those two buildings in the east and came out in their back. I didn't know this 4 were the last ones, had seen some movement north of the toilet, so I was surprised when someone said "Thats it, at least for this sector". Pretty much at the same moment Grunty said "Let's show them what we are made of" and those 5 soldiers in the northeast were surrounded by the rest of them. Ok just did the battle again. I'm playing on experienced level, so there are 60 enemies, 30 from the east and 15 each from south and west. The story is the same, when I killed the last enemy it was like the fight is finished and everyone stood up, but at the same time the rest of them spawned. The problem was that this time there were not that much from the east guys left but there where about 20 coming from east and south. A lot of my soldiers were in the northeast zone and nearly all militia. At the same time I got reinforcement of 3 militia (only lost those 3) from the middle sector. Militia seems to be in a pool there, because 1 of those bad guys run away to the middle sector. When the fight was done he was standing there with the other 17 militia from the reinforcement pool, the fight started not until I entered the middle sector with my first squad. An early game DCA is still pretty cake, even in the newest version. 1. Even on a normal Bobby Ray setting, you should somehow be able to score a few 9mm SMGs, or even some 9x18mm machine pistols, or a 7.62x25mm SMG. Buy them used and repair them, or hire some decently equipped AIM mercs, or whatever. Stockpile tons of ammo. 2. Get your cheap freebie mercs from the rebels... Ira and Dimitri. Give them one of these aforementioned SMGs or machine pistols, and lots of ammo. Pretty much all the ammo you get from enemy drops at this point are those two pistol calibers, or else maybe some 7.62x25, so it should be reasonably plentiful. 3. Save enough money to train some green shirts! Even if lots of them die, they slow down the enemy somewhat, and can keep you from getting completely overwhelmed. And the ones that get promoted afterwards for surviving are a bonus. 4. Pre-position your mercs before the attack! Have them all take the rooftop over the restrooms. Have them face outwards towards the most likely angles of attack... and have them go prone! Also have them do their nonsense like changing NV/sunglasses, etc. I've generally seen the attack come from the south and east, with lighter numbers from the west and flankers from the east wandering in from my north. I usually keep someone on the northwest corner to keep an eye on my team's backs. In a pinch they can shoot somewhat eastward to stay useful. 5. Suppression. On a bum like Ira or Dimitri's turn, their sole job is to shoot long bursts, even if they are outside effective range. As long as the rounds aren't all visibly falling short, they shoot. You might be reloading after only two rounds of shooting, but that's what they do. You probably want two more mercs doing this same thing, so two per side on the hardest hit sides, and enough to split up in case you need 3 sides of your rooftop covered. These bursts can be aimed at one target roughly in the center of the enemy group, or you can use spreadfire if you think that's more effective. 6. Your better shot mercs can use longer ranged pistols, again even if outside of their normal range, and hopefully pick off the enemy as they go prone or crouch down. You will be outnumbered, so the more lead you throw downrange the better. This isn't the sort of fight where you wait to shoot until they are close enough to ensure a hit! Try to let them trickle through your wall of bullets. Basically, the key is to almost play the game like you've already got rifles and machine guns... establish a good firing position (from a rooftop surrounded by open terrain) and use suppression with whatever you've got. If you've already purchased sniper rifles or 5.56mm weapons, fuhgettaboutit. It gets even easier from there. I put my mercs in the bar, lower right corner, facing the door with little more than 3 MP5/10s and some random SMGs and a shotgun or two. Usually I can score interrupts on everyone that comes through the door and shoot them before they can hurt anyone and I never use militia help to prevent waiting for their turns. Its a pretty long battle, I usually save 3-4 times just in case it crashes and read a magazine while waiting for idiots to walk inside. Sneaking over to the door to grab a few good guns, ammo and/or shoot a few rounds to attractive attention and run back to the corner every 20 or so guys. That sounds effective. Also boring. Personally, I think the central rooftop that I stake out, surrounded by open terrain, is too inviting to pass up. And the mercs are still exposed enough to take fire on occasion. Sometimes I have to scramble one of them from one side of the roof to the other to help out large numbers of enemies on one side. If you get any sort of long distance weapon, like a Mosin, you can use militia like spotters and shoot from the southwest corner of the roof down the street all the way to the mine entrance. Not great accuracy, especially with targeting only coming from militia, but sometimes you've got nothing better to do while covering that firing arc, and when you connect it definitely helps out the greenshirts that are getting their arses handed to them down there. If go out of drassen into the southern swamps (where you need to go anyway to search for Skyrider and to attack the SAM site or plunder a possible secret weapon's cache) - you can get the DCA forces in the swamps before they can rally around Drassen Mine. The swamp sectors provide some cover and camouflage. You can also make use of the water and deep water to keep enemy from flanking or rushing you. But most importantly there will be not as many enemies at once (like if it was ~100 if they combine in Drassen, you will likely not face more than about 50 at once in the swamps). Agreed on that bump. It's a very valid way of dealing with the DCA if you are feeling overwhelmed. That's what it looks like, if you have e.g. a sniper on a rooftop and a heavy weapons soldier (fired 2 HE and 2 stun). Secondary explosions of the carried items of the enemies will do the rest. But this is obviously not a stock 1.13 screenie (must be AIMNAS, eh?). Despite different weapons and stuff you might or might not have acquired in AIMNAS till DCA happens, the battlefield is quite different and therefore tactics from different maps have to be treated with caution ... JFTR. what i don't understand is how did they get that far in such masses? Yes, that's AIMNAS. But AI is the same. Shoot at them and they'll come for you. Weapons used: Ares M4 Shrike, Steyr Scout Tactical, MAS-49, M40A1, Smle. No.5. As one can see in the picture, it is raining, I guess it was a rainstorm because I had lightning between the rounds. So, everyone had the view range reduction of 30%(ini default setting). While weapons reliability penalty is doubled during a rainstorm, I am not sure if that's true for the visual distance decrease, too. Have placed the mercs on the rooftop and assigned them to work until enemies arrived. By that moment I haven't finished training of the first militia squad. So while I was carefully sneaking on the rooftop some of them were coming towards the entrance. I shot with sniper rifle and continued positioning. After some rounds I noticed that there are a lot of enemies and shot with the M79 what caused this mess. There were some few attempts of single enemies to surround me but they got kia. Yes, that's AIMNAS. But AI is the same. But Line of sight, ways they can take, cover, roofs, fences, buildings and so on are very different from stock 1.13. Hence: Tactics that may work great on the AIMNAS battlefield may be poor in stock 1.13 (and vice versa). We should not mix it up here, IMO. Then please take only the advice to attract the enemies and fire with grenades, if they tend to group. maybe i'm wrong but isn't release 4552 a standard 1.13 release? I might also point out that the comparison to vanilla is kind of useless. The DCA is disabled in vanilla... it takes 1.13 just to unlock it, so of course the 6 IMPs in 1.13 allow you to manage the DCA reasonably well. 1)consider taking and holding Chitzena before you take Drassen. This gets you income from the boxing matches in Mona (barring bugs), and the Chitzena mine. The counterattack there can be won with modest amounts of militia if you take out one of the two attacking forces. Fighting your way to Chitzena and back also gives you some basic weapons, should your Bobby Ray setting be less than spectacular. 2)Take out one of the attacking groups. That means your mercs vs. 20 with 20 reinforcements. Flee when you need to, whittle them down. Wash, rinse, repeat, and do NOT take Flo(I think it's Flo) as she will very quickly leave you. 3) Let them crush a token force of militia, then skirmish them into oblivion, starting with the support armies. Last I checked, the support armies can not reinforce one another, and if the primary group rolls over Drassen, it leaves the others high and dry. Remember, this is not Rambo:the game. 8)Barry Unger, cheap hire and maestro of the mine. Also good for fixing things and picking locks. If you run out of explosive ordinance before the fight is done, you didn't pack enough. If you run out of stun grenades or mustard gas before the fight is done, you didn't pack enough. Use all the one shot dirty tricks you HATE when the AI is smart enough to use on you, and keep using more. Enemy around the corner? Toss a stun grenade and a canister of mustard gas. If the enemy can not breathe, he can not fight. Enemy interrupting you? Toss a grenade (stun or otherwise) at them. If the enemy can not stand, he can not fight. I always do the exact same thing. However, I usually go for the enemies drop everything setting along with very fast advancement for item choices. That way I'm always well equipped when the counter-attack comes. I retreated when they took the mine sector (during day) and waited for the night. Then I attacked with 6 mercs with pistols and SMGs - I stayed close to the house closest to the upper sector to have some cover. Also I have always stayed relatively near the edge of the sector, so when they started to overhelm my position I simply retreated all the mercs to next sector and attacked again. I did it three times and was able to kill all the enemies. The only problem is that the longer you stay in the sector the more enemies have enough time to come to your position and with 90+ enemies in the sector this will get you in trouble at some point. However this can be solved by retreating the mercs to the next sector and attacking again. Another way how to do this - it was already mentioned here couple of times - is to take cover in some building - bar, or the mining office and wait for the interrupts when the enemies will be coming there one by one (you can shoot them in the leg and get their weapons easilly btw). But I have always considered this as a kind of cheating, cause the AI is not very well prepared for this situation (in this situation they should first throw grenades through doors - smoke, mustard, explosive, whatever and THEN come inside). Roof, molotovs and breaklights, no militia and lots of HP rounds a couple of teargas too if i'm lucky with drops. Well thats how i remember doing it the last time playng vanilla 1.13. Get on the roof in the middle of the map, seal of the north western side with a teargas grenade, find a nice funnel point, usually just of the eastern corner and in the alley down southeast. Seal of areas you can't cover with molotovs. Leave the main street approach for a 3-4 rounds as it takes time for enemies to advance there. Use your treasure trove of every single caliber you've amassed this far to spew destruction in the general direction of the enemy. Don't go for the kill, maim. If the enemy is down to critical move on to the next one. Not only to conserve ammo but also to stifle their ability to send in fresh troops. It's better to face 16 fresh soldiers and 16 dying than 24 fresh and 8 dying. Once things gets tight as they will don't go easy on throwable devices. Tossing down a molotov will not only kill those who are caught in the fire but the AI will usually let some soldiers sit on the edge of the fireball so a round or so after the fire subzided, there be new ones to fry in the same are. Ok, I started playing recently again (expert) and was faced with drassen counter attack challenge again. This time I intercepted enemy on their way to Drassen - I simply went out of Drassen to the adjacent sectors and waited for enemy to come. This way I was battling with much less enemies (since they were not positioned ideally to reinforce each other). I picked a sector divided by a river in half (playing 1.13 with AR) - which was great, because I took one of the river banks and the enemies were hopelessly trying to cross the river and I shot them from distance. The rest of the team covered back. However I was quite lucky to get two rifles (M1 and SKS - both great in the beginning) and two small scopes (and had two snipers in the team) - without them it would be much harder. Hello everyone, I've found an excellent hiding place for a 2-6 man team to hide out in for Drassen Counter Attack. Ignore the airport and go straight to the mine. No use buying anything if you dont have income, eh? If you opt for option 3 you can use the opportunity to build up strength AND dexterity! Just have your first guy punch out the merc until he faints, and then use a knife on him to kill him! If your mercs get hurt, rotate them out with anyone else you have when you get the chance. This strategy works excellently in any counter attack too! stockpile on AP pistol ammo and whatnot and you can EASILY take on multiple platoons of enemies without any assistance. Sounds like tough luck to me. You can always retreat and get back later when you have a full team which is armed to the teeth. Here's how I did the Drassen counterattack on Expert, with the latest build. Drop into Omerta, pick up Ira, head over to San Mona. Now here comes the fun part. Using Blood, systematically beat up all of Kingpin's guards in C5 and steal their Commandos, Kevlar Vests and Kevlar Pants. As long as you do it where nobody can see, nobody will be alerted and the rest will remain friendly! Sell the remainder to Tony for another 15,000. Head west to the SAM site, conquer it, but don't bother training militia. You should now have enough cash to call for reinforcements. I called in Barry and Meltdown on long term contracts, and Shadow on a 1 day contract for his Commando with 2x scope. Head back to San Mona and wipe out Kingpin. You'll get a nice Steyr AUG with a 2x scope, along with another 80,000 bucks. Max out your team's contracts while they're still on a low level, as they'll be gaining a ton of levels once the Drassen Counterattack arrives. By now you'll have a team fully armed with Assault Rifles, 4 of which have scopes, head back to Drassen and conquer the entire town. You won't have time to train militia, so you'll have to do hit and run attacks. Managed to wipe out a group of 40! in the zone south of the mine. The bridge and river makes an excellent choke point. Let them recapture the mine, it's fine. Just enter from the north (but stay close to the edge so you can run away, and kill as many as you can before pulling back. Rinse and repeat. Okay, so after some trial and error, i managed to find a half decent location to hole up and actually DEFEND Drassen Mine. This building is in the NW corner of Drassen Mine. I've heard it get called the Dentist's office. At night you'll either have to pick the lock, kick the door in, or shoot the window next to the door as shown (not the other windows, those have chairs in front of em and you cant jump through the windows. Anyway, go into the inner door and position your mercs in numbers 1 through 6. If you're feeling bold, 8 works as an offensive position. The idea is to use/abuse the inside area to let the enemy come to you. They'll run in the door and SOMEONE should get an interrupt. I forget how effective 7 is but you WILL get shot at from there. Anyway, position 1. You want your melee guys at this position; rotate em out as they get hurt (the bathroom's relatively safe, although sometimes the enemy will shoot through the wall. I dont know why). You can use this guy to either kill or knock out guys. When this guy's running low on AP, you really should knock guys out in front of the door. Position 2 is some dude with a pistol. It's two squares away from the door, he'll have the speed to keep shooting. Positions 3, 4, and 5 are safe enough for you to put dudes down, although a good number of their shots will get stopped by the wall; seems like they don't know how to shoot around it. Position 6 seems to be a location where the enemy won't instantly react and shoot you, but you can still get interrupts. This early on in the game, you should put a guy with an SMG or whatever automatic weapon you have here vs anywhere else. Positions 3 thru 6 will occasionally be able to see out into the front lobby and be able to take a shot outside. I advise against this since again it disrupts the plan. 8 is risky; you can get shot here, despite being behind that chair. However, you can shoot back. Being here will disrupt the enemy entering the room, though. Oh, and being in the square where the bathroom entrance will disrupt enemies walking into the room as well. The areas labeled 'Bathroom' and 'Safe Corner' are GENERALLY safe from attack. You can put your medics and extra mercs here. Keep in mind that moving people around will create potential enemy interrupts, so be quick with your movements. Anyway it's a bit of cheese, but this early on you just want to survive. You'll easily get several levels by letting them come in and slaughtering them all. If it's several turns before an enemy walks in, you might have to take someone and have em shoot a wall. That'll create noise and the enemy will investigate...and eventually will pour into the room again. Sometimes the enemy will simply open the office door. You'll have to get someone to close it. Merc in position 2 will be your best bet; Position 1 has to run directly into the enemies and theres a huge chance for an interrupt. Use Alt+move to reduce the chance of interrupts. On the flipside, sometimes you can safely get away with opening the door, getting spotted by the enemy, and then shutting the door again. The merc that opens the door GENERALLY won't get another interrupt for that turn, but if you can get that door shut you'll be able to at least get him back into position. This 'battle' WILL be brutal and heads WILL explode, but this tactic works even on INSANE difficulty. Godspeed.